As Cathrine pointed out to me in a comment, it’s been a long time since I’ve updated this blog. Since basically Christmas no less. So, what’s happened in the last few months? I turned 50. Surprisingly I’ve lived long enough to get there. Morgen and Nora turned 18 (Megan’s 21 now also.) So technically, no more children at home. Just young adults. Went up to the Sandia Ski area one Saturday. Slid in the snow, turned around and started back down the mountain when we nailed a boulder that had rolled off the hill with the right front tire. Blew the sidewall clean off the tire and mucked up the alignment on the car. New tires all around and an alignment later we are good to go. I’ve been sick for just shy of 4 weeks now. Thought it was a cold, then allergies, then ??. Finally went to the doctor on Friday. Sounds like walking pneumonia at this point. So, I’ve been a sluggard and haven’t been doing much. Just trying to get better. I bought a 2001 Crown Victoria car with 120k miles on it. Talk about an ugly car. 🙂 It’s up in Seattle. I’ll fly up there in a few weeks where Paul and I will tear it down to component pieces. The 4.6 litre V8 engine, transmission, electronics, and rear end are all going into my 1969 Triumph. That car is going to run awesome when we finish building her. The twins and I drove to Denver Colorado for the weekend. Met up with some friends, Morgen and Nora went to a concert. Had a great time. Attended a Masquerade party at my friend Char and Mikes. What a night that was. Great wine, awesome food, fun conversation. A co-worker of mine has handed of her old side business to Megan and Collin. They are taking over the Dancing Flame Stones business. Here’s a youtube video from 2008. Dancing Flame Stones. Well. That’s the update for now. I’m headed off to bed to get my 10 hours of sleep just to function minimum right now. This illness is really getting old. Here’s to a great year. 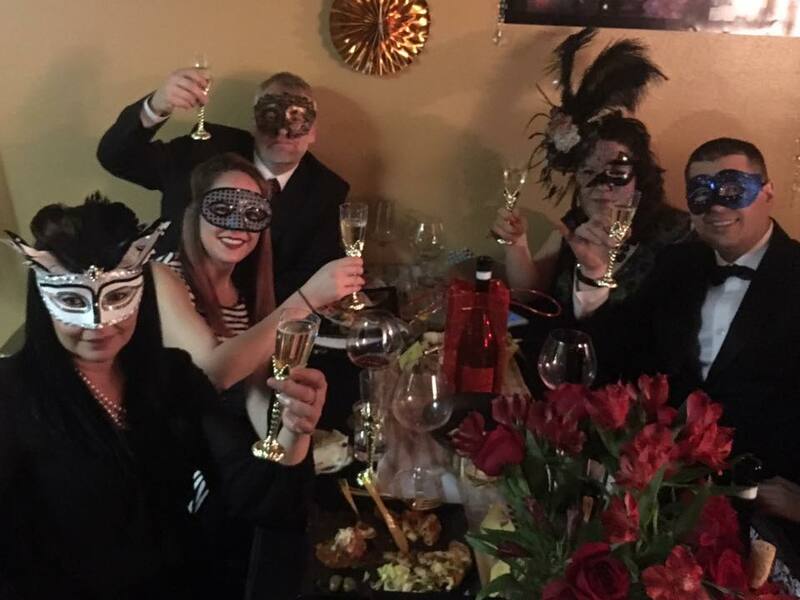 Cheers from the trouble table at Char’s Masquerade Party.